Our Funarena! : Bizarre Happenings: Scoop, Spook and Coup? Coup in the largest democracy of the world? India going the Pakistan way? 'Impossible', 'Operationally not viable', 'Absolutely stupid', 'Alarmist', 'Absolutely baseless'— cried dignitaries at the topmost level, military experts and journalists belonging to various groups and channels all over the country. We said a few days back bizarre happenings in a country ruled by a weak coalition are bound to continue...it has continued. The morning cup of tea yesterday was definitely not at all a pleasant experience for the high and low of the country as they looked disbelievingly at a national daily newspaper. The story covered the full front page of the newspaper. The story was supposed to be a scoop that supposedly spooked the Raisina Hill for a monstrously possible coup. 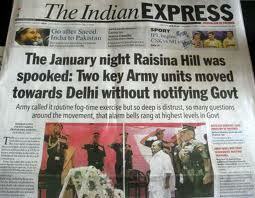 The story, kept under wraps for more than two months for the sheer implausibility of it, reported happenings on the night of January 16-17, 2012 concerning troop movements towards the national capital Delhi. Two units of the Indian Army—mechanized infantry battalion from Hisar (Haryana) and elite Parachute Brigade from Agra—started marching towards Delhi on the night of January 16, 2012 without notifying the Defense Ministry or the Government. Morning on that fateful day General V K Singh—Chief of Indian Army—filed a petition in the Supreme Court against the Government on his date-of-birth dispute. The story went on saying that the troop movements sent the power corridors into a tizzy and frantic efforts were made to halt the movements. The story cited shockingly poor Government-Army relationship and high-level corruption lobbies as the main reasons for such unfortunate situation of a near-coup in the country. The newspaper stood by it story despite all the negative reactions to it mentioning highly credible sources. Bizarre! But why—the common people may ask. Well, in our country nobody starves for reasons or justifications as if democracy has endowed it all on them. Opportunities are bountiful for the interested, particularly at this juncture. And who? Guesses are not that difficult to make. India has been a country of vested interests and lobbies. They resent any attempt to change the system, they resist any righteous movements, they make it a policy to malign right-minded honest individuals and they oppose or try derailing any attempt to prosecute the corrupt. Like the middle agents rob the farmers of their rightful dues every season, brokers move around in power circles to grab the lucrative supply contracts in various departments and institutions. One may very well imagine the immense possibilities in such a huge and strategically important institution like the Indian Army. The Army Chief having a clean image and trying hard to free the system of corruption is bound to face the most horrendous resistance. Therefore, such lobbies can go to any extent to discredit the patriotic Indian Army and malign the Government-Army relationship. Only one thing is becoming very difficult to accept. How could a group or a lobby—whatever the power or clout it enjoys—take the most prestigious national newspaper on such a monstrous ride? The Editor in Chief of the newspaper has lent his name to the story. There are also reports that a senior minister might have leaked this story to the paper. Further more the news of troops movement was reported earlier in rediff. Finding truth in the midst of all these is a task. I think everything has still not come out.